Main drivers for the introduction of Long Term Evolution of UTRAN (LTE) is to provide far better end user experience for mobile broadband services. However, service providers also need to have a clear strategy of how to offer voice and messaging services for consumers and enterprises. The voice service over LTE is becoming increasingly important when the smartphone penetration is increasing rapidly. Smartphones require both good quality voice and high speed broadband data. 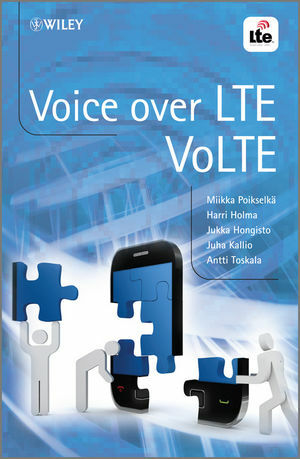 This book provides the exhaustive view to industry-approved technologies and standards behind the Voice over LTE (VoLTE). Whether a decision maker or technology analyst, this book explains a topic of substantial global market interest. It provides a good introduction to the technology and is useful for operators who may be deploying VoLTE, product managers responsible for VoLTE products and those who work in implementation and standardization of related technologies. Miikka Poikselkä, Program Manager, NSN, Finland. Harri Holma, Principal Engineer, NSN (NSN Fellow), Finland. Jukka Hongisto, Solution Architect, NSN, Finland. Juha Kallio, Architect, NSN, Finland. Antti Toskala, Head of 3GPP Radio Standardization, Finland. The authors are all with Nokia Siemens Networks (NSN) in Finland working on the cutting edge technologies for mobile communications today. They are involved with 3GPP Standardisation, and technical aspects, ensuring they are a in key position to write on this important topic.